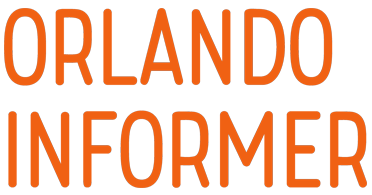 Quick-service restaurant with a small, specialized menu and outdoor seating — open seasonally. Located at the entrance to Seuss Landing, this quick-service restaurant has one specialty: “Say! I like Green Eggs and Ham! I do! I like them, Sam I Am!” Oh, and if you are trying to take the shortcut from the park entrance to the Wizarding World of Harry Potter, this is where you want to take a left and head alongside the lagoon. Green Eggs and Ham Cafe at Universal’s Islands of Adventure. Green Eggs and Ham Cafe is closed far more than it is open. If you really want to try this one-of-a-kind sandwich and you see that the restaurant is open, go get it now! 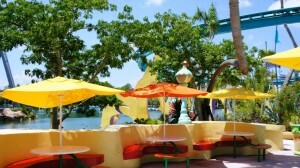 Call me a kid at heart, but whenever I walk in the Seuss Landing area, it's takes me back to my youth. We all read one of Dr. Seuss' books at one point or another. 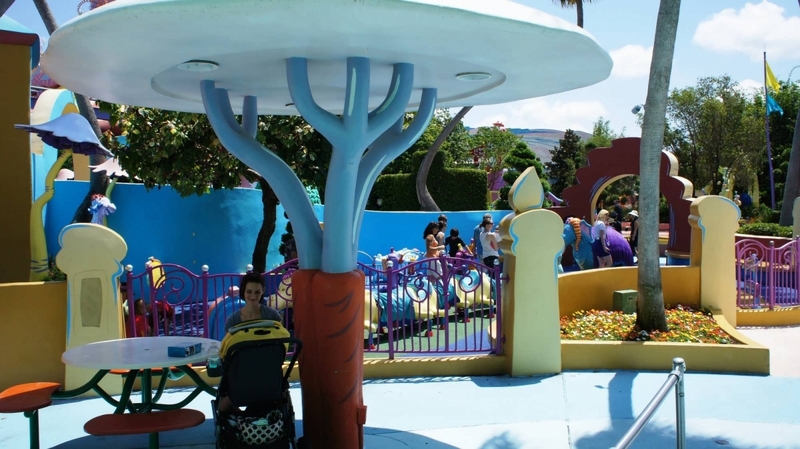 So to see a whole area dedicated to his creations, well that's pretty cool in my book. Lots of colors and energy in the whole area. 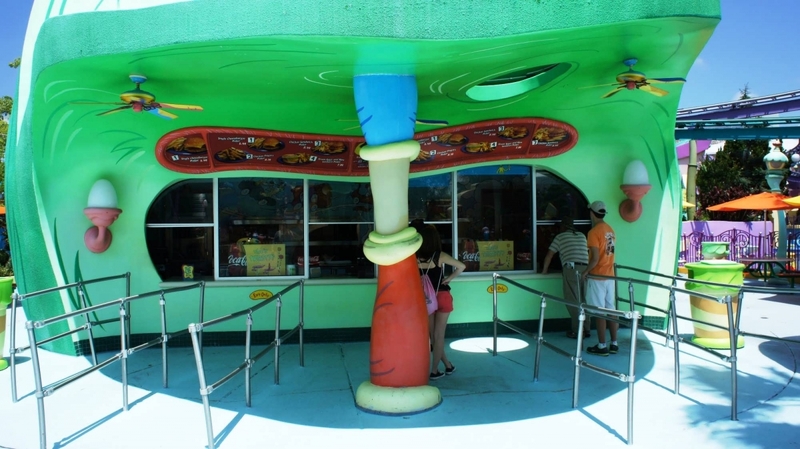 Of course, you can't bypass something called Green Eggs and Ham Café. I played it safe and got the Chicken Fingers Platter, which hit the spot. 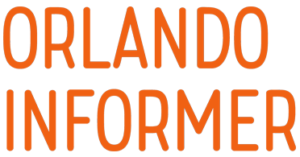 If you're nearby, give it a try. It won't be a waste, it has just the right taste! I had lunch at the Green Eggs and Ham Cafe on May 14, 2013. 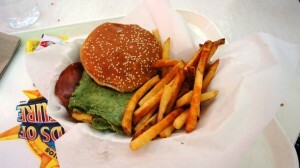 My order consisted of the Green Eggs and Ham Sandwich, Fries and a Chocolate Chip Cookie. Here is my review of that lunch. not a bit of grease, on any one piece. I did much savor, the wonderful flavor. it was just as tough, as leather stuff. they had a bad taste, so into the waste. 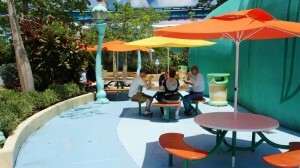 Five days at IOA, and on our LAST day, Green Eggs and Ham Cafe was FINALLY OPEN!! Hooray!!! I talked to the super nice cashier and she told me this restaurant is only open during busy times, so take advantage if you find it open! 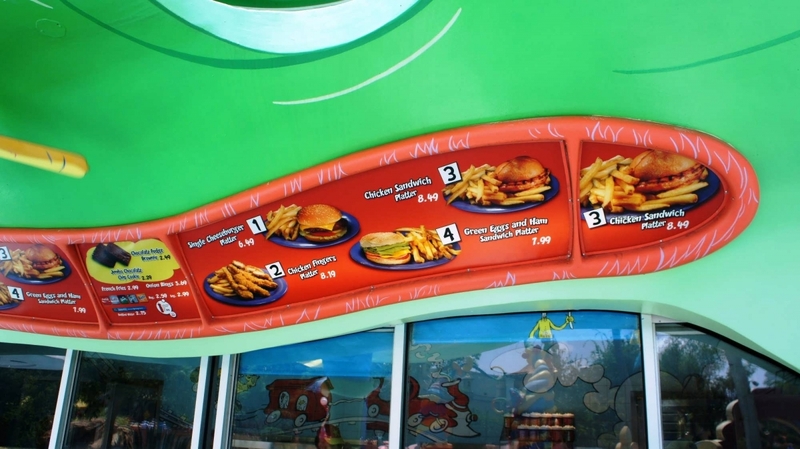 Of course, what other reason to go than to try the Green Eggs and Ham Sandwich Platter? 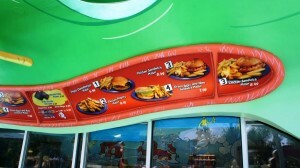 Ordering Green Eggs and Ham from a restaurant shaped like Green Eggs and Ham!?!? This Seuss geek was in HEAVEN!!! The sandwich itself was tasty. Warning: it looks disgusting, but really- green... it's to be expected. Don't be afraid- just take a bite. 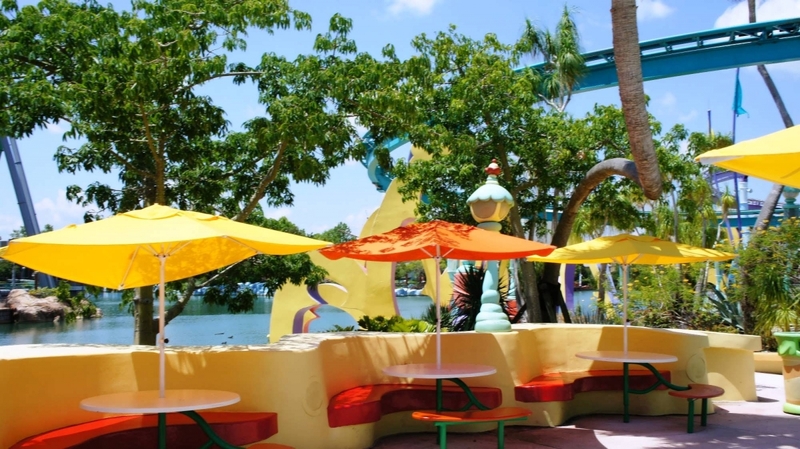 Sitting outdoors, eating Green Eggs and Ham in the middle of Seuss Landing, next to a Green Ham shaped restuarant... it just doesn't get any better for Seuss fans. Once just a story in a book, now the opportunity to try some unique, fun and delicious! 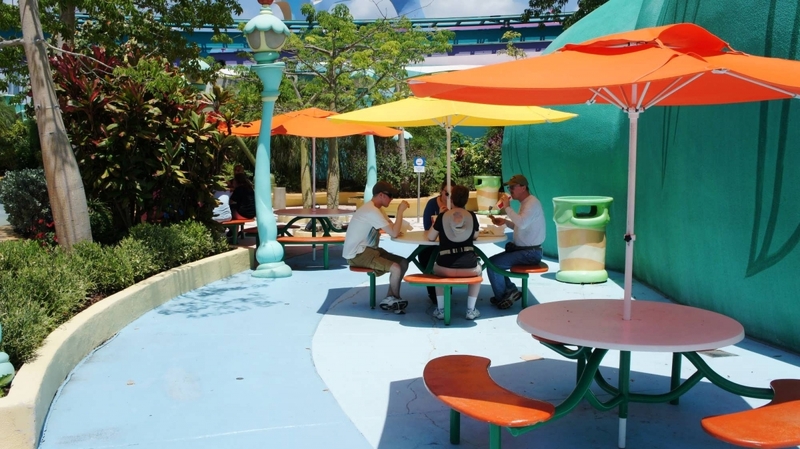 The Green Eggs and Ham Cafe at Universal Orlando's Islands of Adventure is rarely open, but when it is make sure to stop by and try their signature meal. 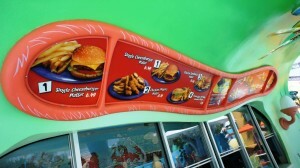 This eatery offers a few other options for people less adventurous such as burgers and chicken. 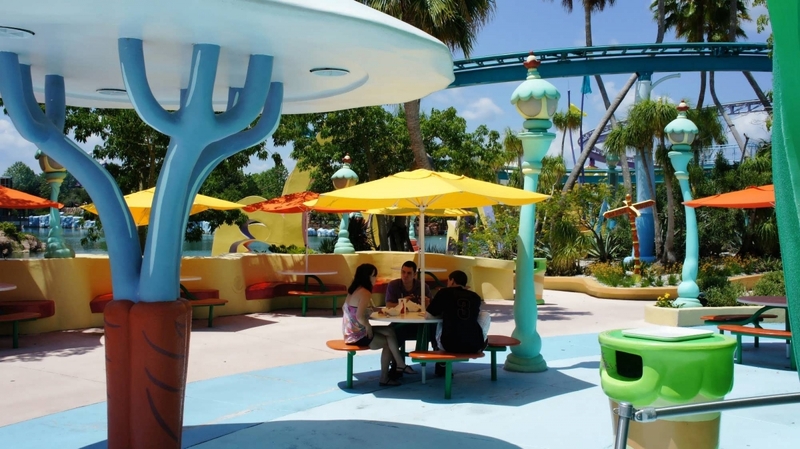 There is just something about being in Seuss Landing and munching on Green eggs that helps give you a vacation from the ordinary. 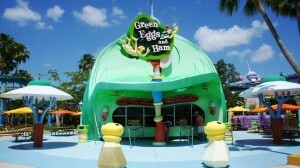 My visit to the Green Eggs and Ham Café was my very first dining experience at IoA way back in 2000. I was so excited to try the green eggs and ham sandwich! It did not disappoint! 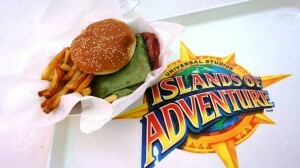 It was very tasty and I still remember how much fun it was to get something straight out of a childhood storybook. 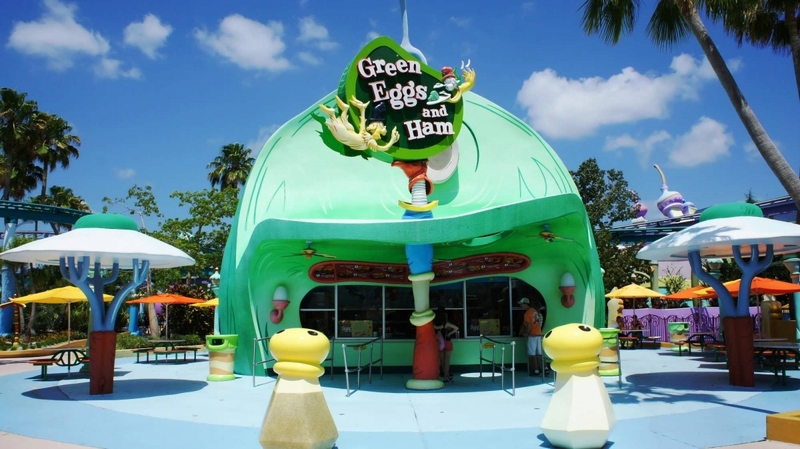 I would recommend this walk up dining experience to anyone who wants to try REAL green eggs and ham.